As I trekked to Everest Base Camp this month, I often thought about the 16 Sherpas who were crushed to death by an avalanche just days earlier as they ported the loads of Westerners through the Khumbu Icefall far above me. And I thought about their 40-some children who were left fatherless. • A young porter laboring up the steep rocky trail at 16,000 feet with a full-sized gas oven on his back, so that Westerners could enjoy fresh croissants and birthday cakes in the 1,000-person tent city they call Base Camp. • Porters each shouldering several 4-by-8-foot plywood sheets for tent floors, together with 12-foot-long 4-by-4s for the foundations, so that Westerners could enjoy flat floors in their tents. 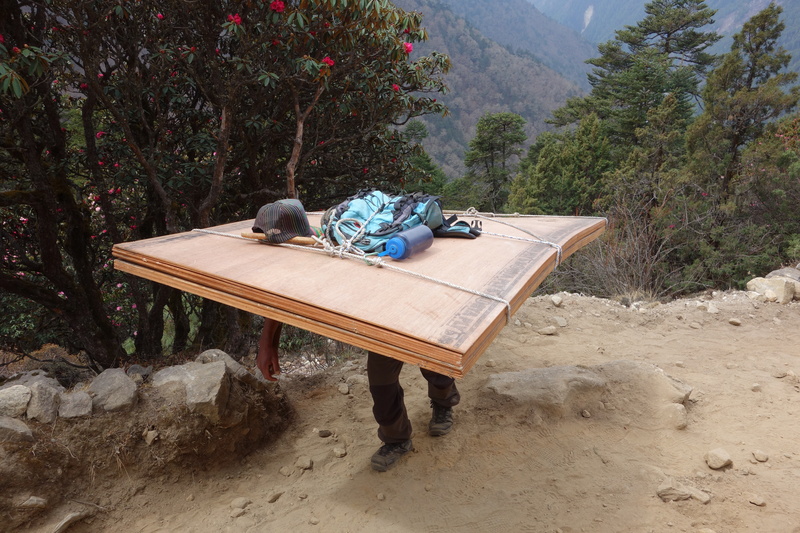 • Porters carrying as many as nine cases of beer in a single backbreaking load (as for what that weighs, do the math) because all that “climbing” by Westerners works up a thirst. • Porters carrying movie-making equipment in hard plastic cases the size of a large briefcase, stacked together as many as 10 deep in a single load extending from their knees to 4 feet over their heads, all so that Westerners could document their “climb” of the mountain. • A porter hauling, among many other items, a golf-club case. • Porters carrying stacks of tables, chairs and even sofas and loveseats so that Westerners had comfortable places to sit. • Porters laden with solar panels to recharge the laptops of Westerners who were surfing the Internet and watching movies. They are a Buddhist ethnic group that migrated over the Himalaya from Tibet to Nepal about 400 years ago. Since then, they’ve eked out a living in stone villages at 8,000 to 17,000 feet, where they farm potatoes and barley on steep, terraced slopes and raise yaks (an odd beast of burden that looks like a cross between a bison and a wooly mammoth) in a country where the average annual income is less than $500. Because they and their ancestors were raised at such high altitudes, they are extraordinarily fit aerobic athletes. Even with the Western advantages of modern training regimens and performance-enhancing drugs, and even with the Sherpa disadvantages of poor nutrition and bad health care, virtually no Western climbers can match the Sherpas. When Western climbers compare one another, Sherpas are left out of the comparison because they are in a class by themselves. A Sherpa holds the record for the most Everest ascents (21), and another holds the record for the fastest ascent from Base Camp (just over eight hours on a route that takes Western climbers five days). They are not large people. Typically they stand about 5 feet, 7 inches and weigh perhaps 135 pounds. Loaded with the equipment and luxuries of Westerners, they are hunchbacked to about 4 feet, 6 inches and weigh about 210 pounds. That’s who the Sherpas are. And just who are these Western climbers for whom they work? And so is he. Mallory disappeared on the mountain in 1924. Through their telescope below, his team last saw him moving upward on a cliff less than 1,000 feet from the top. He was next seen about 75 years later when his broken and mummified remains were discovered far below (and left there, as is customary). We’ll never know if Mallory fell on the way up or the way down. His daughter reported that he’d carried with him a photo of his wife, which he intended to leave on the summit. Intriguingly, no such photo was found with his remains. Whether he stood on top or not, Mallory was one of the great climbers of his age and a tough SOB. The undisputed first to summit Everest, in 1953, were a New Zealander named Edmund Hillary and a Sherpa named Tenzing Norgay Sherpa (the last name of an ethnic Sherpa is traditionally “Sherpa”). A gentleman all his life, Hillary refused to reveal which of the pair stepped onto the summit first. Equally a gentleman, Norgay said decades later that it was Hillary. Modern mountaineers still see the achievement of Hillary and Norgay on the highest mountain on earth, in one of the most primitive regions on earth, as an epic story of mountaineering. Hillary was promptly knighted by the queen of England. He devoted the rest of his life to building schools for the Sherpas. In a country where the literacy rate is still barely 60 percent, the Hillary schools are priceless and the great Sir Edmund Hillary is revered. Mount Everest has now been summited (or “conquered” in the vernacular of people who don’t know any better) by more than 5,000 people and by 650 last year alone. It has been “conquered” by an 80-year-old man, by a 13-year-old boy, by a double-amputee man, by a single-amputee woman, by a man climbing solo and by a blind man. I fully expect that it will soon be “conquered” by a 13-year-old, double-amputee blind girl climbing solo. Western guide outfits sell spots on their annual expeditions for upward of $100,000 per person. Some of their “conquering” clients have little or no climbing experience. The tricky parts of the “climb” are pre-roped for them, the crevasses of the Khumbu Icefall are bridged with aluminum ladders, and oxygen bottles are awaiting them at the high camps, all furnished and maintained by (you guessed it) the Sherpas. Everest has been skied and paraglided. Some “conquerors” have parachuted out of airplanes in the vicinity to boast that they’ve “skydived Everest,” as if the air through which their parachute glides knows the geography of the nearby land. Until the avalanche ended this year’s climbing on the standard route, the Discovery Channel intended to broadcast a special on a “conqueror” jumping off the top in a flying-squirrel suit. Last year, a “conqueror” stripped naked on the summit for five minutes. Don’t get me wrong; there’s nothing wrong with attention. For those who can’t get or give love, and those who don’t have the creativity or courage for real adventure, attention is the next-best thing. But here’s what’s wrong. It’s wrong to bribe an impoverished and illiterate member of the Third World into putting his life at risk — the life of his children’s father — for a Westerner’s attention-getting stunt to impress other Westerners who don’t know enough not to be. So next time someone brags about climbing, skiing, paragliding, unicycling, skateboarding, tricycling, bungee jumping, skydiving, rollerblading, motorbiking, tobogganing, sledding or squirrel-suiting Mount Everest, whether clothed or naked or with a ring in her nose or a tiara on his head, know enough not to be impressed. This entry was posted in Uncategorized and tagged Everest, Sherpas by onthebeatontrack. Bookmark the permalink.